Description: "S.S. Sagona" arriving at Harbour Grace with crew (possibly a sealing crew) visible on deck. The 'C' symbol found on the Crosbie and Company house flag is visible on the vessel's stack. Notes: Title based on vessel name which is evident in the photograph. 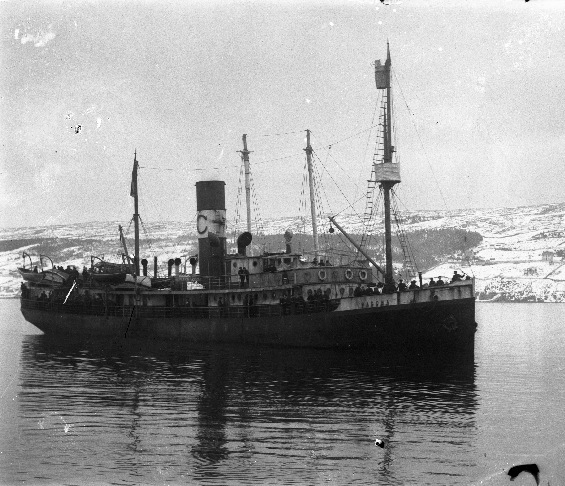 Although the Newfoundland Produce Company apparently owned the "Sagona only from 1912-1915, and it was during this time that the "C" from the Crosbie house flag would have been painted on the stack, it is possible the stack was not repainted under new ownership, and therefore the photograph may have been taken after 1915. Subjects: Sagona (Ship) / Harbour Grace (N.L. ).